Grant Turner (Senior Economist) discusses how fintech credit offers an alternative funding source for businesses and consumers, but also gives rise to challenges for regulators. For financial stability, challenges and benefits may arise if the fintech credit sector grows further, or if banks make greater use of similar technological innovations in providing credit. JEL classification: E51, G23, O31. Financial innovations enabled by digital technology, or "fintech", have started to play an important role in the provision of many financial services. While technological development in finance is not new (Dermine (2016)), progress has arguably sped up in the digital age. Fundamental advances in the internet, mobile communications, distributed computing, and information collection and processing have underpinned a range of recent innovations in finance (see FSB (2017a) and IMF (2017) for an overview). Consumers in both advanced and emerging market economies have increasingly adopted digital financial services that are more convenient (Ernst and Young (2017)). Given the importance of credit for the economy, this special feature focuses on the development of fintech credit. We define it as credit activity facilitated by electronic platforms that are not operated by commercial banks. While fintech credit has grown rapidly around the world, the volume of activity (per capita) varies greatly across economies. We find that these differences, to the extent they can be explained, reflect factors that also affect more traditional forms of credit. Notably, the higher a country's income level, the larger is fintech credit activity. Reflecting its competition with other sources of credit, the volume of fintech credit is greater the less competitive the country's banking system is. 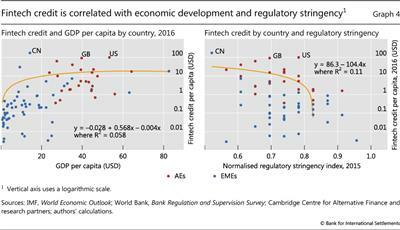 Yet, in contrast to other forms of credit, fintech credit volumes are currently higher in economies with less stringent banking regulation. Fintech credit has grown rapidly in recent years, and is larger in some economies, notably China, the United States and the United Kingdom. 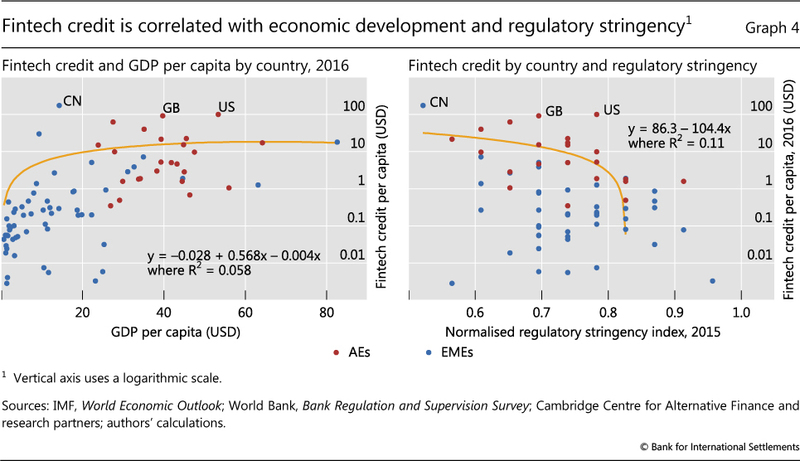 The size of an economy's fintech credit market is positively related to its income level, and negatively related to the competitiveness of its banking system and the stringency of its banking regulation. Fintech credit offers an alternative funding source for businesses and consumers, and may improve access to credit for underserved segments. But, as some operational failures and conduct problems highlight, fintech credit poses challenges for regulators in ensuring adequate consumer and investor protection. For regulatory authorities, the rapid development of fintech credit gives rise to opportunities, but also challenges. If managed well, there may be broad benefits for financial inclusion and financial system diversity. Challenges currently centre largely on ensuring adequate consumer and investor protection through licensing and conduct regulation. Hence, concerns have arisen about growing fintech credit losses and poor business conduct in some economies, exemplified by recent platform failures in China. Concerns about financial stability may also emerge if the sector grows further (CGFS-FSB (2017)). A review of regulatory approaches reveals commonalities, but also key differences, such as in risk management rules for fintech credit firms. This relates in part to different perspectives on how to balance risks with the goal of fostering greater innovation. The remainder of this feature is organised as follows. First, after introducing our definition (Box A), we sketch how fintech credit platforms operate and contrast this with credit provision by the traditional banking sector. Next, we show how the size, growth and nature of fintech credit markets have evolved across jurisdictions. We then examine the factors that might determine fintech credit using simple regression analysis. We also present a case study of China (Box B), currently the single largest fintech credit market. We go on to discuss the potential benefits and risks of fintech credit for end users and the broader economy and financial system. Finally, we detail some of the approaches regulatory authorities have taken. How does fintech credit work? Fintech credit is facilitated by electronic (online) platforms. Platforms can vary significantly in design, but they all use digital technologies and innovations to interact fully (or largely) with customers online and process large amounts of customer information.2 Platform business models have generally become more complex since the industry's inception in 2005 with the UK platform Zopa. There is no internationally agreed definition of fintech credit. We define fintech credit broadly to include all credit activity facilitated by electronic (online) platforms that are not operated by commercial banks. This approach is consistent with that taken in CGFS-FSB (2017). This definition of fintech credit encompasses all credit activity facilitated by platforms that match borrowers with lenders (investors). Depending on the jurisdiction, these platforms are referred to as "peer-to-peer (P2P) lenders", "loan-based crowdfunders" or "marketplace lenders". It also includes platforms that use their own balance sheet to intermediate borrowers and lenders. In principle, the credit activity of platforms provided by technology companies can also be included. Compared with other credit providers, a unique characteristic of fintech credit entities is that they make use of digital technologies and innovations to interact fully (or largely) with customers online and process large amounts of customer information. At this point, commercial banks, even those with online services, do not digitise credit processes to the same degree and typically use offline processes and staff. Crucially, unlike fintech credit platforms, banks also accept demand deposits. This function is a key reason why commercial banks are subject to various prudential regulations and supervision, including extensive data reporting requirements. To date, fintech credit providers generally lie outside this prudential regulatory (and reporting) perimeter. For this reason, fintech credit is effectively considered part of the alternative credit market. Measuring the size of fintech credit is challenging, in part because of its novelty, small size and diversity. Official national data are limited, as fintech credit platforms are not subject to regulatory reporting requirements in most jurisdictions. Hitherto, the most comprehensive data have been collected by the Cambridge Centre for Alternative Finance (CCAF), together with academic or industry partners. These data are compiled by surveying fintech platforms, and where possible supplemented with other information from public reporting and secondary sources (such as platform websites). Private sector data providers such as industry bodies or firms producing fintech credit analytics also provide some statistics (eg AltFi Data, WDZJ.com, the Crowd Institute and P2PFA). 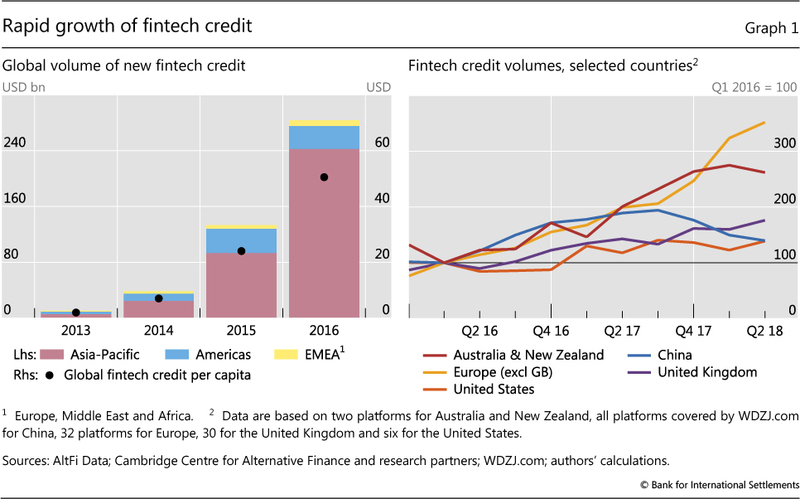 These and other data yield a reasonable picture of the size and recent growth of fintech credit markets across economies. However, there are several limitations. First, they do not include all platforms; some sources consider only the largest ones, in part because many platforms have very little turnover. Second, they exclude some types of activity that could arguably be considered as fintech credit. For example, online mortgage lenders, prominent in some countries, are generally left out, even when they automate nearly all processes and match borrowers with institutional investors. Similarly, in China, and more recently in the United States and some Latin American countries, large technology or "big tech" firms, excluded from most data sources, have become important lenders. Most notably, some e-commerce platforms now extend credit to merchants using their platform. 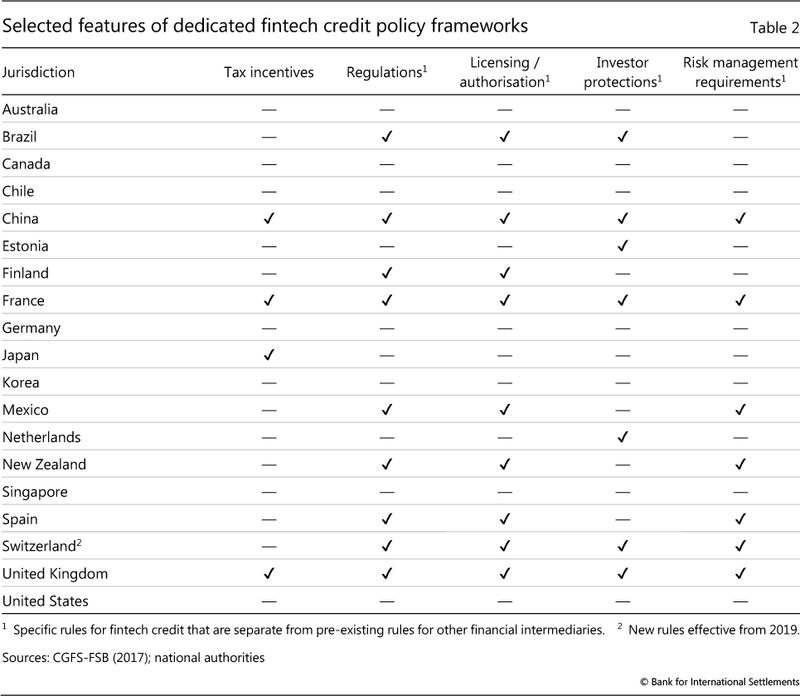 Given these limitations, the amount of fintech credit is likely to be underestimated for some (key) jurisdictions. Lastly, data on the stock of total fintech credit, as opposed to new credit originated, are generally not available. While individual platforms may disclose very granular data on loan amounts, types, maturities, interest rates, defaults, etc, these data too are not available consistently for the sector as a whole. These credit platforms are often grouped under the umbrella term of "internet finance" or "digital finance", which also includes platforms that facilitate equity or donation crowdfunding, or provide wealth management and insurance solutions. Prominent examples in the United States are Quicken Loans, Loandepot, Guaranteed Rate and Amerisave. For instance, Alifinance and its successor Ant Financial have provided loans and short-term funds to small and medium-sized enterprise vendors on Alibaba's platforms since 2010 (Chen (2016)). Amazon Lending provides loans to merchants on Amazon. In Argentina, Brazil and Mexico, Mercado Crédito provides working capital loans to entrepreneurs on Mercado Libre. In a simple peer-to-peer (P2P) business model, the online platform provides a low-cost standardised loan application process and facilitates direct matching and transacting of borrowers and investors (lenders).3 Prospective borrowers provide information on their own finances and the project for which they seek funding; investors then review it on the platform (most often only after the platform has verified it). Once a borrower and investor are matched, loan contracting comes into force directly between them. This ensures that the investor, rather than the platform operator, takes on the risks immediately. Investments and loans are usually duration-matched, with investors unable to liquidate their investments before expiration. The only way for an investor to take money out early is to find another investor willing to take over the investment. Some P2P platforms assist this process by providing a secondary market where investor sales can take place or a credit's rights can be transferred. Once the loan is originated, the credit platform acts as an agent for the investors by servicing the loan in return for ongoing fees. The platform maintains records, collects borrower repayments, distributes cash flows to investors, and manages the recovery of unmet obligations. Credit platforms typically encourage investors to spread risks. Investors can choose to spread their investments across (portions of) multiple loans, and often can automatically gain exposure to a portfolio of loans based on the risk category and terms they select. Among P2P consumer platforms, more than 95% in the United States and 75% in Europe use an auto-selection process (Cambridge Centre for Alternative Finance (CCAF) and Chicago-Booth Polsky Center (2017); CCAF (2018)). Indeed, it has become increasingly common in a number of countries for platforms to structure investments as units in a (diversified) loan pool (ASIC (2017a), FCA (2018a), Shen and Li (2018)). This portfolio approach can be combined with advertised target rates of return. Partial protection against loan defaults is another platform service. For example, platforms in several countries maintain a contingency fund that is designed to top up payments to investors if a borrower defaults. In facilitating credit, fintech platforms can provide monitoring and servicing functions similar to those of traditional credit providers such as banks. 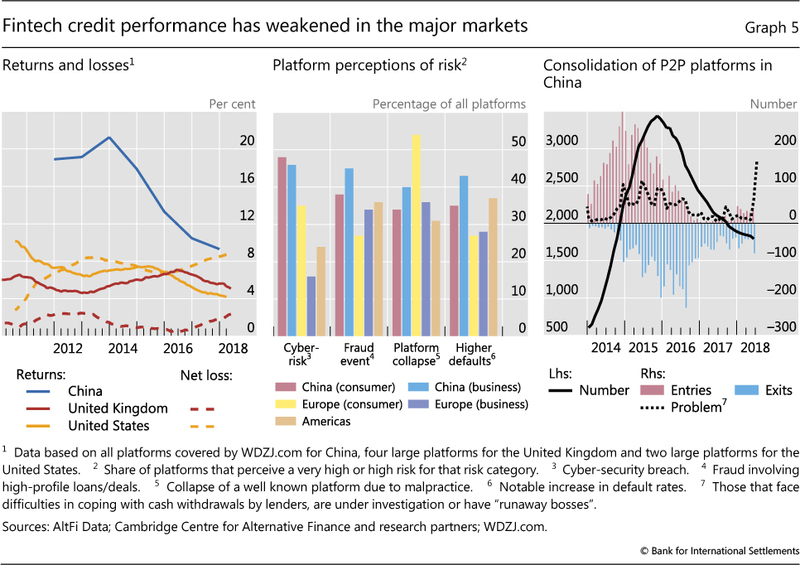 For most platforms, a key difference is the lack of a balance sheet for intermediating borrowers and lenders and assuming credit and other risks. Consequently, rather than earning a net interest margin, most credit platforms use an agent model that depends on retaining and attracting an investor base to generate fee revenue. However, a minority of platforms in some jurisdictions retain loans on their balance sheet, operating more like non-bank credit intermediaries. Prior to a ban in 2016, many platforms in China also offered return or capital guarantees and promised investors the ability to redeem their investment (Box B).5 Such practices, in effect, generate a claim on the platform's balance sheet and a liquidity mismatch, and thus give rise to the risk of a "run" on the platform. Of course, banks have access to exclusive customer data from their deposit and lending books. Banks have also begun to make greater use of new digital techniques, including applications in credit risk modelling. But they are generally not yet as advanced, in part due to some operational constraints, such as data quality and consolidation issues (van Liebergen (2017)). Finally, from the retail investor perspective, fintech credit is a new investment category distinct from lower-yielding, but safer, bank deposits.8 Moreover, fintech credit to businesses can be more diversified than single-company credit and more closely tailored to investor preferences in terms of risk and maturity. In this respect, it is similar to some asset management products, such as corporate bond funds. Available data show that fintech credit activity has expanded rapidly in many countries over recent years, albeit from a very low base. Estimates from the CCAF indicate that $284 billion in such credit was extended globally in 2016, up from $11 billion in 2013 (Graph 1, left-hand panel). Fintech credit has, however, evolved rather unevenly across jurisdictions. 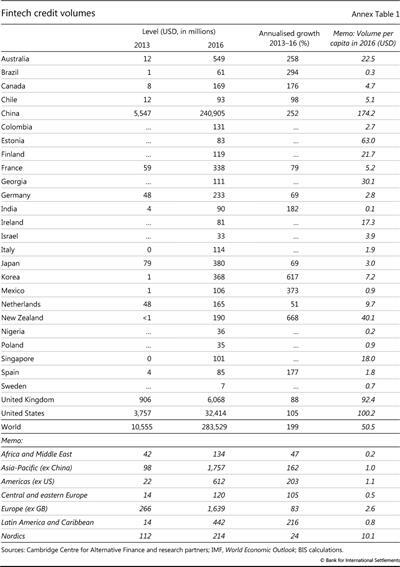 In absolute terms, China was by far the largest market in 2016; the United States and the United Kingdom followed at a distance, with other large advanced economies further behind (Annex Table 1). In per capita terms, fintech credit was relatively high in several smaller economies, including Estonia, Georgia and New Zealand. Sources: Cambridge Centre for Alternative Finance (CCAF) and research partners; BIS calculations. Update: Errors in the interactive graph labels have been corrected. After very rapid growth in 2013-16, more recent data indicate a slowdown in many major jurisdictions. New lending volumes in China have even declined noticeably over the past few quarters (Graph 1, right-hand panel). In spite of solid growth, fintech credit represents a very small share of overall credit flows in most jurisdictions. Market shares are higher in China, with WDZJ.com estimating that it accounted for about 13% of overall new lending in the first half of 2018. In the United States, credit volumes, as measured by the CCAF, amounted to about 4% of overall net loan originations in 2016. Fintech credit appears to play a larger role in specific market segments. For instance, in the United Kingdom it constituted about 15% of the lending flow of comparable bank credit to consumers and small and medium-sized enterprises (SMEs) in 2016 (CCAF (2017)). In the United States, it accounted for as much as 36% of unsecured personal loans extended in 2017 (Levitt (2018), citing TransUnion data). Estimated fintech mortgage originations (not included in the CCAF or AltFi data) amounted to 8-12% of the total in 2016 in the United States (Buchak et al (2017), Fuster et al (2018)).9 The fintech lender Quicken Loans was the single largest mortgage originator in late 2017 (Sharf (2018)). Most consumers use fintech providers to refinance or consolidate existing debts, but some use it to finance major purchases (such as vehicles or real estate). Borrowing by students to fund higher education is prominent in the United States and China.10 On the business side, small and micro enterprises typically seek funds for working capital or investment projects. Financing can also be in the form of "invoice trading", whereby investors purchase discounted claims on a firm's invoices (receivables). The composition of credit activity by borrower segment varies across countries. 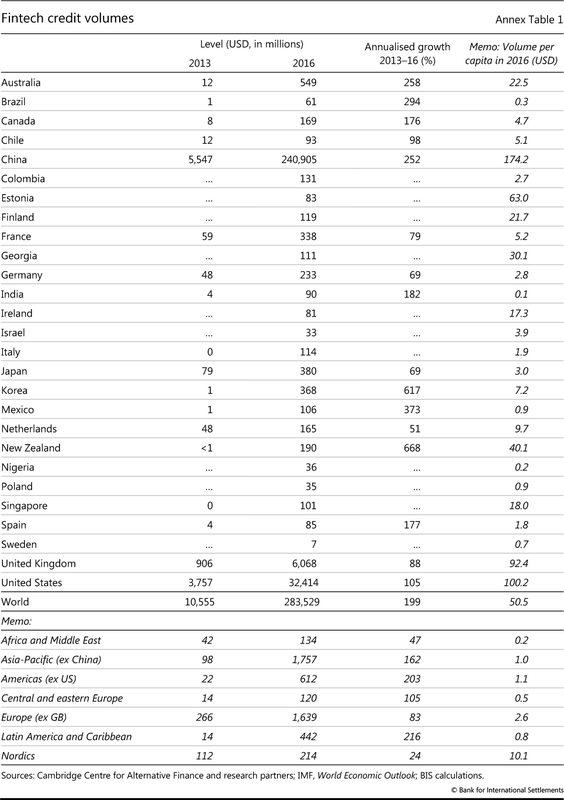 In Germany, New Zealand and the United States, consumers are by far the largest borrowers (Graph 2, left-hand panel). 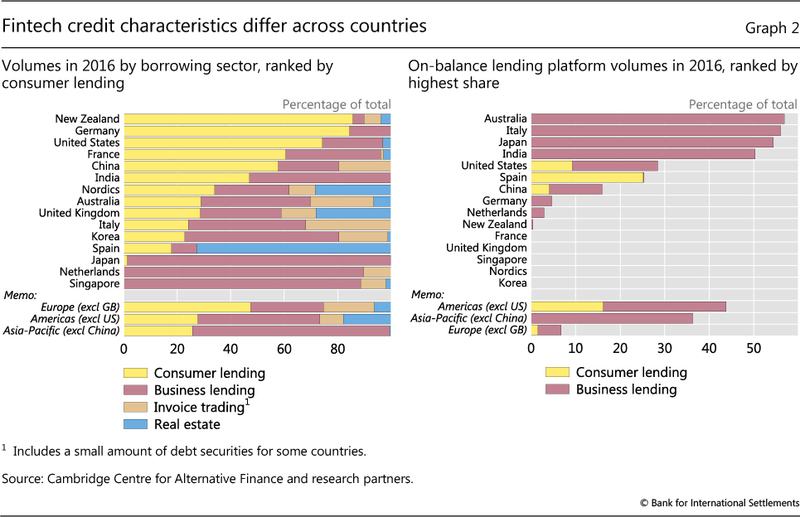 In contrast, in Japan, the Netherlands, Singapore and several other markets, lending to businesses is more prevalent. In Australia and Italy, invoice trading accounts for a relatively large share. Business lending tends to be the main credit type for fintech credit platforms that retain loans on their own balance sheets (right-hand panel). 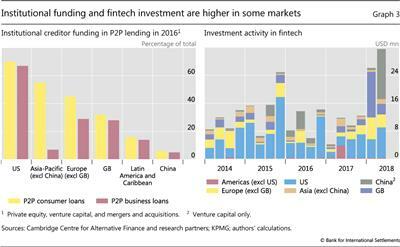 In many jurisdictions, especially China, fintech investors are mainly individuals, as suggested by the P2P branding of many platforms. However, in some countries, institutional investors have gained ground. For example, the available data suggest that, in 2016, institutional investors funded the majority of new loans in the United States and parts of Europe (Graph 3, left-hand panel). Indeed, because of their significant involvement, fintech lending in the United States is now typically referred to as "marketplace lending" rather than P2P lending (US Department of the Treasury (2016, 2018)). Institutional investors can fund loans on credit platforms in bulk. Securitisation has become another important funding avenue in the United States, with around $13 billion of investments in P2P loan securitisations issued in 2017 (US Department of the Treasury (2018)). Despite the global reach of technology, the size of fintech credit differs markedly across countries. This points to the likely role of country-specific factors. Which have been the drivers of fintech credit? Some factors have had an impact on all forms of credit. These include a country's economic growth, its level of economic and financial development, and the quality of its legal and other institutions (eg Demirgüç-Kunt and Levine (2018)). Another set of factors might relate to the degree of competition in credit markets. A less competitive banking system could mean higher margins on bank credit and thus boost alternative credit sources like fintech credit. Furthermore, if platforms are able to better assess borrower information or reach customers than existing credit providers, fintech credit could be greater in jurisdictions where accessing credit is more difficult. Deeper capital markets, as in the United Kingdom and the United States, can help to provide funds for platforms to develop (Graph 3, right-hand panel). The intensity and quality of financial regulation could also matter. A priori, the overall effects can be ambiguous. More stringent overall regulation might engender trust in new forms of financial intermediation. Alternatively, it could inhibit innovation and deter potential market entrants. Sector-specific rules can matter too. In particular, less intense regulation of fintech activities could aid their growth; it could even encourage regulatory arbitrage to the extent that similar risks are regulated more tightly in the traditional lending sector. Recent cross-country research on the drivers of fintech activities provides useful insights. Rau (2017) finds that barriers to entry and prevailing financial depth (ie credit to GDP) help promote the volume of crowdfunding, as do the rule of law, control of corruption, and quality of regulation in general.11 Moreover, crowdfunding is larger in economies where existing intermediaries are more profitable, suggesting that a lack of competition also matters. Navaretti et al (2017) find that investment in fintech firms (scaled by GDP) is higher where an economy has greater financial depth, as proxied by ratios of credit and bank assets to GDP, and lower where the banking sector is more regulated, suggesting that regulatory arbitrage plays a role. where ci is the volume of fintech credit per capita in economy i in 2016; yi is the log of GDP per capita in economy i, which we treat as a measure of economic development, and the variable captures possible non-linearity in the relationship; LIi is the Lerner index of banking sector markups (an indicator of market power) in economy i;14 and RSi is a regulatory stringency index for the banking sector of economy i, as constructed by Navaretti et al (2017) (a higher value indicates more stringent regulation). All explanatory variables are lagged, and most are averaged over a number of years to avoid short-run variations driving our results. 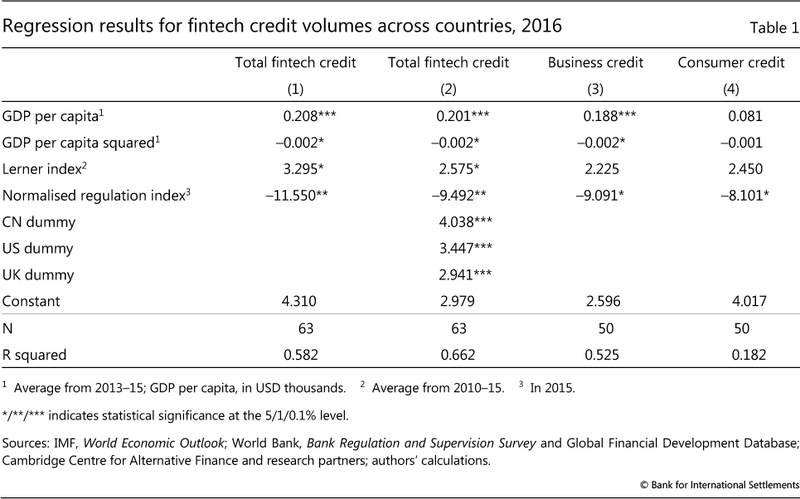 The regression results confirm that an economy's fintech credit volume per capita is positively associated with GDP per capita (Table 1, column (1)). Since GDP per capita is likely to be a proxy for many other aspects of a country's stage of development (indeed, it is highly correlated with several of the other possible explanatory variables we examined), the relationship could capture any of several possible effects. In any event, this result confirms a broad positive relationship between a county's overall economic and institutional development and the depth of fintech credit. The negative coefficient estimate on squared GDP per capita suggests that such effects become less important at higher levels of development. The positive coefficient estimate on the Lerner index suggests that there is more fintech credit activity in those jurisdictions with a less competitive banking sector. This is consistent with the notion that fintech credit offers relatively lower costs and greater convenience in these countries. The relationship, however, is not that important economically. We find that more stringent banking regulation deters fintech credit activity. This could have several possible explanations. It could suggest that fintech regulations are also more liberal in jurisdictions where banking regulation is more liberal. Conversely, it may be more difficult to launch new lending activities in countries with relatively strict prudential and bank licensing regimes. This provides some evidence against the argument that regulatory arbitrage boosts fintech activity in general. That said, it does not rule out its role in individual countries. Dummy coefficient estimates indicate that the amount of fintech credit in the three largest markets - China, the United States and the United Kingdom - is much larger than what would be suggested by the drivers included in our model (column (2)). This suggests that there might be country-specific factors at work. However, the impact of the other variables that we consider remains strong. Box B explores some of the idiosyncratic factors underlying the larger amount of fintech credit activity in China. Our analysis suggests that, under various different model specifications, GDP per capita and its quadratic term account for 64-78% of the explained variation in fintech credit volume per capita. The stringency of banking regulation explains 14-20%, the banking sector markup (Lerner index) 1-2%, and the country dummies about 10%, 5% and 6% for China, the United States and the United Kingdom, respectively. The drivers of fintech business credit segments appear to be very similar to those of overall fintech credit, except that the banking sector markup is no longer statistically significant (column (3)). For consumer credit, our model does not perform as well: the R2 is lower (column (4)), and the coefficient estimates for GDP per capita and banking sector markup are not statistically significant. On the other hand, regulatory stringency does appear to depress consumer credit activity, similar to the cases of aggregate and business fintech credit. Given how young the industry is, it is too early to properly evaluate its impact on end users, ie lenders and borrowers, let alone on financial stability and the economy at large. Moreover, differences in institutional arrangements and data limitations make it hard to generalise. Nonetheless, with these caveats in mind, it is possible to identify some benefits and risks, drawing also on the findings of recent analytical work. With respect to the impact on users, in principle the use of new digital technologies and more granular customer data promise greater convenience, lower transaction costs and better credit risk assessments. Some micro-evidence of specific markets and platforms is consistent with this notion. Fuster et al (2018) find that fintech lenders in the United States improve borrower convenience by processing mortgages 15-30% faster than other lenders, on average. The authors do not find evidence of higher (conditional) default rates. Jagtiani and Lemieux (2018b) find that rating grades of the US platform LendingClub, which are assigned based on non-traditional data, predict loan performance well and allow certain borrowers to obtain more favourable terms. In a similar vein, Berg et al (2018) find that a German P2P platform's default risk assessments, incorporating data on the digital footprints of customers registered on its website, outperform its assessments based on credit bureau data alone. There is also evidence that fintech platforms have widened access to credit (De Roure et al (2016), Jagtiani and Lemieux (2018a), Baeck et al (2014), US Department of the Treasury (2016)). For the United States, Tang (2018) finds that P2P lending is a substitute for bank lending in that it serves infra-marginal bank borrowers, but also complements bank lending for small-scale loans. In China, fintech credit is arguably well suited to fund small firms and less affluent consumers: with their access to traditional bank credit limited, these borrowers have often had to resort to informal private and more expensive lenders. For instance, there is evidence that automated credit lines to firms trading on Alibaba's e-commerce platform increase access to credit for firms with a low credit score (Hau et al (2018)). In a survey of retail borrowers on a large Chinese platform, more than half reported that they had no borrowing history from a financial institution (Deer et al (2015)). Similarly, a survey of businesses borrowing on platforms in Chile and Mexico found that half had no access to other external funding sources and very few had bank loans (CCAF and Inter-American Development Bank (2018)). Notwithstanding these benefits, the resilience of new fintech credit processes and firms has not yet been tested over a full economic and credit cycle. Hence, it is not clear how fintech credit will perform when conditions deteriorate. There are cautionary indicators in some countries. For instance, higher platform default rates have reduced investor returns in China, the United States and the United Kingdom (Graph 5, left-hand panel). 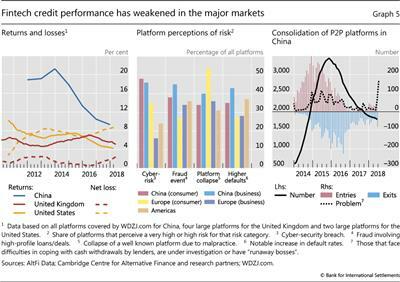 Moreover, a significant share of platforms identify the risk of higher default rates as a very high or high (Graph 5, centre panel). Default rates have also increased recently in Australia (ASIC (2017b)) and Korea (Bank of Korea (2018)). For most of these countries, higher fintech credit default rates have occurred at a time when non-performing loan rates in the banking sector are historically low. It is thus possible that, in their drive to expand, some fintech platforms have catered for a higher share of riskier, marginal borrowers. Indeed, some evidence (Chava and Paradkar (2018)) suggests that entry of a fintech credit platform can leave consumers more indebted, with increased default probabilities. Aside from lower returns, investor confidence has also been shaken by some business misconduct and failures. For example, in 2016 investor demand for fintech credit took a hit when the largest US platform, LendingClub, had to repurchase loans that did not conform to buyer requirements and senior executives' conflicts of interests emerged. In China, the P2P industry has seen a sharp rise in the number of "problem platforms" over recent years. Many platforms there promised unrealistic returns and/or "rigid redemptions"; instances of fraud were also common.15 These issues, together with tighter regulation and measures designed to encourage the exit of non-qualified P2P platforms, contributed to a significant decline in entrants and a surge in platform exits in 2015-16 (Graph 5, right-hand panel). These issues gained widespread media attention in July and August 2018 after a spate of failures (eg Chorzempa (2018)). P2P lending has become a significant source of funds for small firms and consumers in China. The ratio of new P2P loans to new bank loans rose to almost 40% in June 2016, before falling to less than 10% in June 2018 (Graph B, left-hand panel). As P2P loans mainly meet borrowers' short-term funding needs, maturities are rather short (right-hand panel); the ratio of outstanding P2P loans to bank loans was only about 1% in June 2018. Market concentration is low and falling: the top 100 platforms' share was below 30% in July 2018 (left-hand panel). 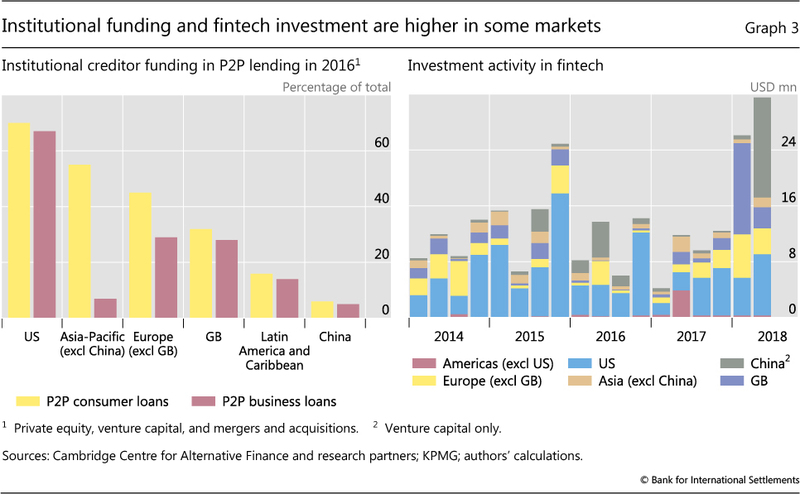 Several unique factors have contributed to the more rapid rise of P2P lending in China. First is the relative availability of financial services: P2P lending caters to borrowers that formal credit intermediaries typically ignore, especially small and micro firms and consumers on whom the creditworthiness information is at best imperfect. 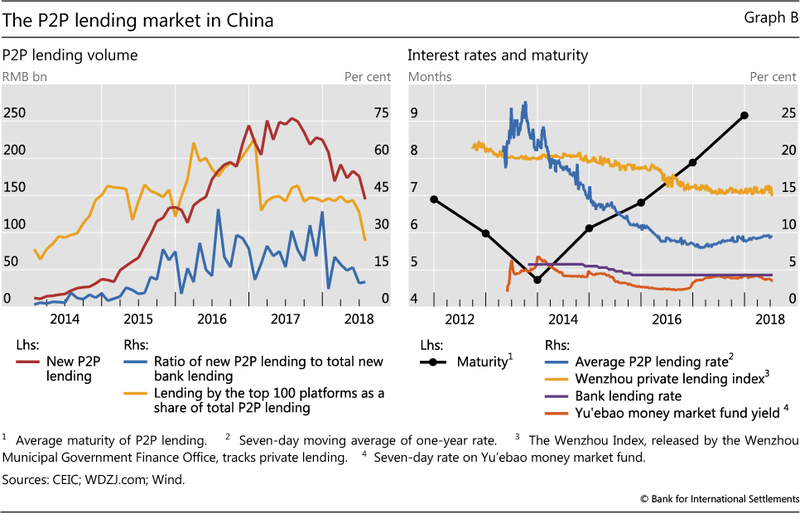 P2P lending rates, though higher than those of banks, are far lower than the private lending rates available for such borrowers (Graph B, right-hand panel). Limited alternative investment opportunities and the promise of higher returns have also attracted many retail investors. Second, Chinese consumers, merchants and investors have enthusiastically embraced mobile technology for financial transactions, including payments (Ernst and Young (2017)). Third, an initially more permissive regulatory environment encouraged firms to innovate and expand, with a growing number of platforms supported by the state and venture capital. In recent years, however, the regulatory regime has tightened. The modalities and risks in the Chinese P2P lending market have changed over time. In the early period following its inception in 2007, P2P credit firms in China operated simple matching models, whereby investors bid for contracts offered by borrowers. From around 2012 onwards, platforms moved to more complex structures where investor funds were pooled (Shen and Li (2018)). Many platforms provided guarantees on loan principal and interest, and promised "rigid redemptions". But risks rose due to inappropriate market practices and fraud, including Ponzi schemes. Defaults surged and the number of problem platforms reached 114 in June 2015. Over the next two years, authorities implemented a nationwide "clean-up" that aimed to ensure internet finance firms acted as information rather than as credit intermediaries. New rules prohibited existing practices by P2P firms such as raising funds for themselves or guaranteeing investments, and mandated the depositing of client funds. Further specific measures were taken in 2017: new student loans were banned and the regulation for cash loans was tightened. The industry has consolidated significantly, with many problem platforms exiting the market (Graph 5, right-hand panel). Yet this process is still incomplete; risks remain and the number of problem and failed platforms has risen sharply in recent months. These recent experiences highlight several key questions for platform users, operators and regulators. How well do investors and borrowers understand the risks they are facing? Do fintech credit platforms disclose risks appropriately? Are platform fees and interest rates reasonable?16 Are business models overly complex? Do platforms have adequate operational risk management practices, including for data and cyber-security risks? Turning to broader systemic impacts, at this stage the small size of fintech credit in many jurisdictions limits its impact on the economy and financial stability. Nonetheless, CGFS-FSB (2017) identifies a range of benefits and risks should the sector become much larger. Among the potential benefits are broad economic effects stemming from greater financial inclusion and alternative funding and investment options. Any such effects could be relatively large in those emerging market economies where access to credit and investment products is more limited. Greater diversity in the sources of credit could lower the risks that the economy faces when a few banks dominate credit provision. For example, some platforms may be able to continue to facilitate credit in the event that there are idiosyncratic problems in the banking sector. Credit platforms could also allow governments to revive credit markets after a banking crisis. Fintech credit could also yield benefits through its impact on commercial banks. There are already signs that commercial banks have begun using fintech credit innovations to improve efficiency. Some banks now partly rely on fintech platforms' credit assessment processes; others have recently set up their own credit platforms. In addition, many banks are now using or introducing machine learning techniques, most commonly in retail credit portfolios (IIF (2018)). This could widen any economic and financial effects. A related risk is the potential for fintech innovations to erode incumbent banks' profitability and franchise values. Should these disruptions occur too quickly, they could undermine banks' resilience and amplify stress, given banks' provision of critical financial services other than credit. How can public policy balance risks and benefits? What role should regulation play? To the extent that fintech credit firms are regulated, they can be drawn into either existing or new regulatory frameworks. An important guiding principle is likely to be neutrality - ensuring that regulation does not favour one entity or form of activity over another provided the risks are the same (BIS (2018)). For this reason, authorities may apply stricter treatment for certain types of activity, such as where a claim on the platform's balance sheet is generated or where retail investors and consumers are involved. For example, in Australia and the Netherlands, fintech credit providers must apply for a specific licence (and meet the associated stricter requirements) to facilitate credit to consumers. In the United States, platforms engaging in credit origination can be subject to licensing requirements in each state where they operate. For this reason, many platforms partner with banks to originate loans agreed online. There is a similar practice in Germany, where platforms are prohibited from engaging in lending without a banking licence and related prudential oversight. A number of countries have introduced specific new regulations and licence regimes (Table 2). These changes have all occurred since 2015, and some are quite recent. For instance, Brazil and Mexico introduced new rules and licencing practices in early 2018. Licences to operate fintech credit platforms can be subject to general requirements for adequate governance and risk management arrangements, as well as targeted rules, such as those for managing client money. Minimum capital requirements have been imposed in Spain and the United Kingdom, and will enter into force in Switzerland in January 2019. As discussed in Box B, in 2016 the Chinese authorities began introducing new rules to prohibit some high-risk business models and practices, and mandated filing and information disclosure requirements. The development of fintech credit markets can also impact the supervision of existing financial intermediaries. Banks may interact with fintech credit platforms and firms supplying fintech credit assessment services, or adopt fintech innovations in their own loan origination processes. These processes may present new reputational and operational risks, including cyber-risks and third-party risks (BCBS (2018)). Finally, the emergence of fintech credit markets poses broader monitoring challenges. As the sector grows, there will be a need to incorporate fintech developments into financial stability assessment frameworks. FSB (2017a) highlights the importance of monitoring potential related macro-financial vulnerabilities, as well as the role of fintech credit and changes in market structure. 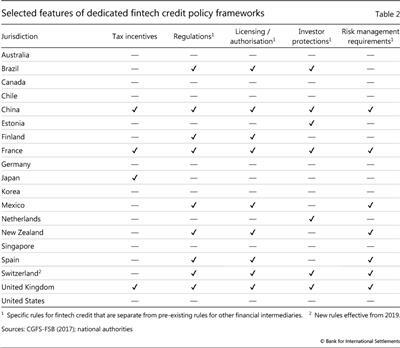 Recent country reports, such as US Department of the Treasury (2018), also highlight the need to monitor fintech credit developments.20 Cooperation between authorities can facilitate learning from each other's monitoring and regulatory experiences. Fintech credit has grown rapidly since its inception in 2005. 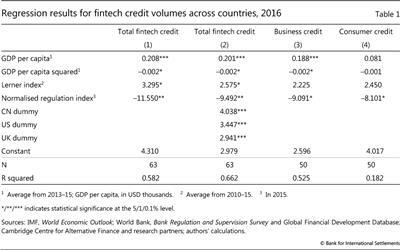 Fintech credit volumes per capita appear to reflect a number of factors. The economy's overall development, the competitiveness of the economy's formal banking sector, and the strength of its regulatory environment play important roles. Despite its fast expansion, fintech credit remains relatively small in most economies. It is, however, considerably larger in China, the United States and the United Kingdom, as well as in specific market segments. Fintech credit has in some cases helped improve credit access for financially underserved firms and individuals, while providing additional options to investors. Yet rising credit losses in some jurisdictions suggest that these innovations need to be further tested over a full financial and economic cycle. The diversity of business models across the industry has given rise to significant challenges for practitioners and policymakers alike. These challenges include ensuring adequate consumer and investor protection, and the timely assessment of overall financial stability and economy-wide risks. The challenges and benefits arising from fintech credit may become greater if commercial banks make more extensive use of these innovations. Australian Securities and Investments Commission (2017a): "Survey of marketplace lending providers", Report 526, June. --- (2017b): "Survey of marketplace lending providers: 2016-17", Report 559, December. Baeck, P, L Collins and B Zhang (2014): Understanding alternative finance: the UK alternative finance industry report 2014, November. Bank of Korea (2018): Financial Stability Report, June. --- (2018): Annual Economic Report 2018, June. Basel Committee on Banking Supervision (2018): Sound practices: implications of fintech developments for banks and bank supervisors, February. Berg, T, V Burg, A Gombović and M Puri (2018): "On the rise of fintechs - credit scoring using digital footprints", NBER Working Papers, no 24551, April. Braggion, F, A Manconi and H Zhu (2018): "Can technology undermine macroprudential regulation? Evidence from peer-to-peer credit in China", SSRN Working Papers, January. British Business Bank (2017): "British business bank expands partnership with Funding Circle", press release, 5 January. Buchak, G, G Matvos, T Piskorski and A Seru (2017): "FinTech, regulatory arbitrage, and the rise of shadow banks", NBER Working Papers, no 23288, March. Cambridge Centre for Alternative Finance (2017): Entrenching Innovation: the 4th UK Alternative Finance Industry Report. --- (2018): Expanding Horizons: the 3rd European Alternative Finance Industry Report. Cambridge Centre for Alternative Finance and Chicago-Booth Polsky Center (2017): Hitting Stride: Americas Alternative Finance Industry Report. Cambridge Centre for Alternative Finance and Inter-American Development Bank (2018): Business access to alternative finance: a deep dive into Mexico and Chile, March. Chava, S and N Paradkar (2018): "Winners and losers of marketplace lending: evidence from borrower credit dynamics", Georgia Institute of Technology working paper. Chen, L (2016): "From fintech to finlife: the case of fintech development in China", China Economic Journal, vol 9, no 3, pp 225-39. Chorzempa, M (2018): "Massive P2P failures in China: underground banks going under", Peterson Institute for International Economics, 21 August. Committee on the Global Financial System and Financial Stability Board (2017): "FinTech credit: market structure, business models and financial stability implications", CGFS Papers, May. Deer, L, J Mi and Y Yuxin (2015): The rise of peer-to-peer lending in China: an overview and survey case study, Association of Chartered Certified Accountants. Demirgüç-Kunt, A and R Levine (2018): Finance and growth, Cheltenham: Edward Elgar Publishing. Dermine (2016): "Digital banking and market disruption: a sense of déjà vu? ", Bank of France, Financial Stability Review, no 20, April. De Roure, C, L Pelizzon and P Tasca (2016): "How does P2P lending fit into the consumer credit market? ", Deutsche Bundesbank, Discussion Papers, no 30. Ernst and Young (2017): EY FinTech Adoption Index 2017: the rapid emergence of FinTech. Financial Conduct Authority (2018a): "Loan-based ('peer-to-peer') and investment-based crowdfunding platforms: feedback on our post-implementation review and proposed changes to the regulatory framework", Consultation Paper CP18/20, July. --- (2018b): "Global Financial Innovation Network (GFIN)", Consultation Document, August. Financial Stability Board (2017a): Financial stability implications from FinTech: regulatory and supervisory issues that merit authorities' attention, June. --- (2017b): Artificial intelligence and machine learning in financial services: market developments and financial stability implications, November. Franks, J, N Serrano-Velarde and O Sussman (2018): Marketplace lending, information aggregation and liquidity, working paper, July. Fuster, A, M Plosser, P Schnabel and J Vickery (2018): "The role of technology in mortgage lending", Federal Reserve Bank of New York, Staff Reports, no 836, February. Hau, H, Y Huang, H Shan and Z Sheng (2018): "Fintech credit, financial inclusion and entrepreneurial growth", working paper. Institute of International Finance (2018): Machine learning in credit risk, May. International Monetary Fund (2017): "Fintech and financial services: initial considerations", IMF Staff Discussion Notes, no 17-5, June. Jagtiani, J and C Lemieux (2018a): "Do fintech lenders penetrate areas that are underserved by traditional banks", Federal Reserve Bank of Philadelphia, Working Papers, 18-13, March. --- (2018b): "The roles of alternative data and machine learning in fintech lending: evidence from the LendingClub consumer platform", Federal Reserve Bank of Philadelphia, Working Papers, 18-15, April. Laeven, L and F Valencia (2012): "Systemic Banking Crises Database: An update", IMF Working Papers, June. Levitt, H (2018): "Personal loans surge to a record high", Bloomberg, 3 July. Navaretti, G, G Calzolari and A Pozzolo (2017): "FinTech and banks: friends or foes? ", European Economy: Banks, Regulation, and the Real Sector, December. Rau, R (2017): "Law, trust, and the development of crowdfunding", University of Cambridge working paper. Sharf, S (2018): "Quicken Loans overtakes Wells Fargo as America's largest mortgage lender", Forbes, 5 February. Shen, Y and C Li (2018): "网络借贷风险缓释机制研究" (research on the risk relief mechanism of internet financing), Institute of Digital Finance, Beijing University. Tang, H (2018): "Peer-to-peer lenders versus banks: substitutes or complements? ", Review of Financial Studies, forthcoming. US Department of the Treasury (2016): Opportunities and challenges in online marketplace lending, May. --- (2018): A financial system that creates economic opportunities: nonbank financials, fintech, and innovation, July. Vallee, B and Y Zeng (2018): "Marketplace lending: a new banking paradigm? ", Harvard Business School, Working Papers, 18-067. Van Liebergen, B (2017): "Machine learning: a revolution in risk management and compliance? ", Capco Institute, Journal of Financial Transformation, vol 45, pp 60-7. Wang, J, Y Shen and Y Huang (2016): "Evaluating the regulatory scheme for internet finance in China: the case of peer-to-peer lending", China Economic Journal, vol 9, no 3, pp 272-87. Wei, Z and M Lin (2016): "Market mechanisms in online peer-to-peer lending", Management Science, vol 63, no 12, pp 1-22. 1 Parts of this special feature draw on CGFS-FSB (2017), a report on fintech credit prepared by a working group established by the Committee on the Global Financial System (CGFS) and the Financial Stability Board (FSB). The authors acknowledge the valuable comments provided by Claudio Borio, Benjamin Cohen, Ingo Fender, Hyun Song Shin and Kostas Tsatsaronis, and thank Matthias Lörch and Jimmy Shek for excellent research assistance. The views expressed are those of the authors and do not necessarily reflect those of the Bank for International Settlements (BIS), the CGFS or the FSB. 2 Key digital innovations include application programming interfaces (APIs), artificial intelligence and machine learning, and predictive data analytics (FSB (2017a), IMF (2017)). 3 In this respect, P2P credit platforms operate similarly to online retail marketplaces such as eBay, AirBnB and Alibaba's Taobao. However, they have features that go beyond the infrastructure needed to effectively match user preferences. 4 Vallee and Zeng (2018) discuss a similar change - the removal by LendingClub, a US platform, of 50 out of 100 variables on borrower characteristics in 2014. They show that such moves are consistent with platforms managing adverse selection by more sophisticated investors relative to less sophisticated investors. 5 Since the 2016 ban, Chinese platform practices and investor expectations around guarantees and redemptions have been somewhat ambiguous (see eg Chorzempa (2018)). A Swedish platform that filed for bankruptcy in 2016 had offered guarantees and easy access to funds (CGFS-FSB (2017)). 6 Machine learning comprises a set of statistical tools designed to fit the data or describe patterns in them, and is distinct from more inferential modelling (FSB (2017b), van Liebergen (2017)). Machine learning algorithms often involve extremely large data sets. 7 See Hau et al (2018) for an account of Ant Financial's credit scoring model and credit evaluation process. 8 It is important to note that fintech credit does not come with many of the safeguards of bank deposits, such as deposit insurance. 9 Both studies use US Home Mortgage Disclosure Act (HMDA) data to track mortgage origination in the United States in recent years. Both consider Quicken Loans, Guaranteed Rate and Movement Mortgage to be fintech lenders. However, while Buchak et al (2017) also count Amerisave Mortgage, Cashcall Inc and Homeward Residential as fintech lenders, Fuster et al (2018) do not. 10 In China, "campus" loans came under stringent regulatory scrutiny and were suspended in June 2017 (Box B). 11 In addition to credit activity, crowdfunding includes equity capital raising and funding via donations. 12 Regulatory stringency is constructed as an index based on the World Bank's Bank Regulation and Supervision Survey. The index takes a value between 0 (least stringent) and 1 (most stringent) based on 18 questions about bank capital requirements, the legal powers of supervisory agencies, etc. 13 A number of further control variables were included and were generally found not to be statistically significant. The online appendix provides further details. 14 The index relates the market price of a product or service to the marginal cost of producing it. It ranges from 0 for a perfectly competitive market to 1 in case of a monopoly. 15 Wang et al (2016) find that those Chinese P2P platforms set up more recently, with a narrower range of or extreme interest rates and non-diversified projects, tend to have a lower survival probability and shorter life expectancy. 16 In the United Kingdom, the Financial Conduct Authority (FCA (2018a)) has identified some poor business practices that it believes cause actual or potential harm to users. In broad terms, these relate to investors not receiving certain information and not understanding risks; and the fairness of platform costs and returns. 17 Braggion et al (2018) show that, in China, P2P loans increased significantly in cities that became subject to loan-to-value caps in 2013, as P2P credit firms did not tighten their pricing and screening in response to the influx of new borrowers. These borrowers were found to have ex post higher default rates. 18 There have also been some cross-border initiatives. For instance, the UK Financial Conduct Authority has put out a consultation paper, FCA (2018b), proposing a Global Fintech Innovation Network to help startups to access multiple regulators simultaneously. In addition, a number of authorities have launched bilateral cooperation with other authorities around fintech innovation. 19 There is also a specific example of direct investment in fintech credit. To boost lending to small businesses, the government-owned British Business Bank invested £100 million over 2014-17 for lending through Funding Circle, a UK credit platform (British Business Bank (2017)). 20 In June 2017, the Chinese National Internet Finance Association (NIFA) launched its Internet Financial Registration and Disclosure Service Platform, which aims to provide more timely information to both the supervisory authorities and the public. By the end of 2017, 116 platforms had joined the system and disclosed operational information.